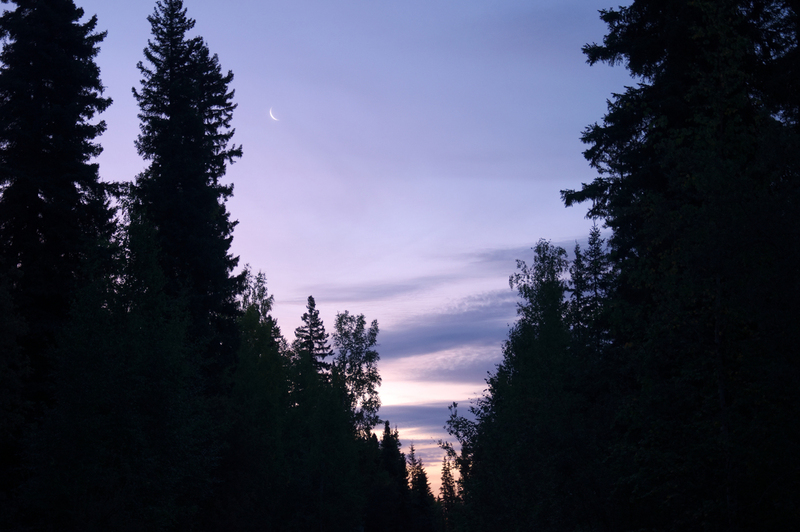 Last Friday I woke up early in the morning, there was a crescent moon in the purple sky. 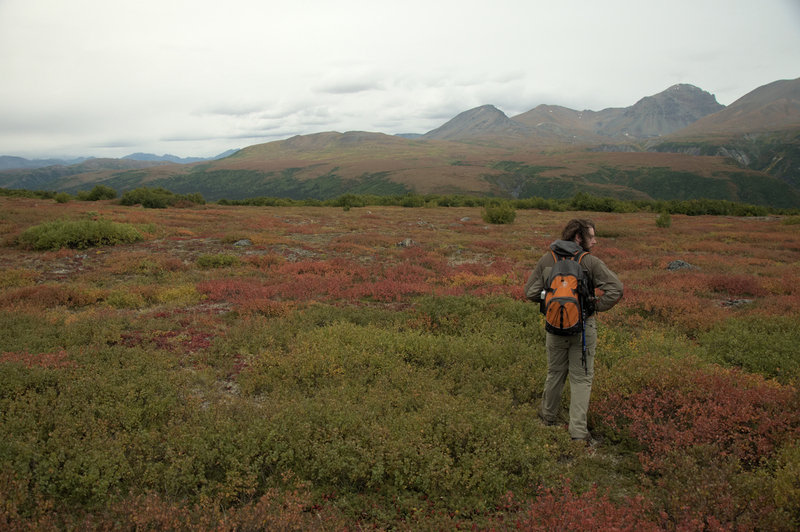 Jason and I left Fairbanks for the mountains south of Delta, part of the eastern Alaska Range to go hiking. We had a great view of the Hayes Range over the Tanana between Salcha and Delta Junction. 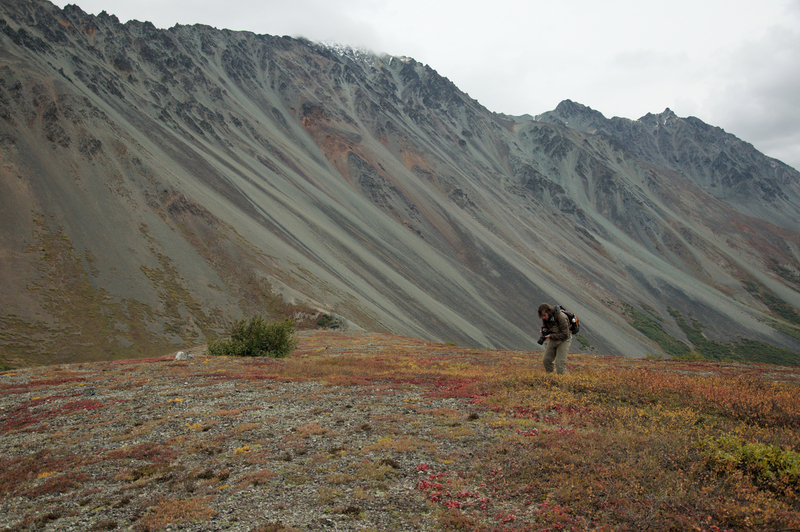 The guidebook, Outside in the Interior: An Adventure Guide for Central Alaska describes the hiking in the area as “limited only by your imagination”. I’m quickly discovering that this is really the only way to describe most backcountry travel in the state of Alaska. I think we both expected more of a “trail” here, but after searching for and failing to find an elusive cairn described by the book we just took off in an upward direction. Down by the road, looking for the trailhead. After about a two or three hundred foot near vertical adventure of literal swimming through alders we managed to get to some more rocky terrain. 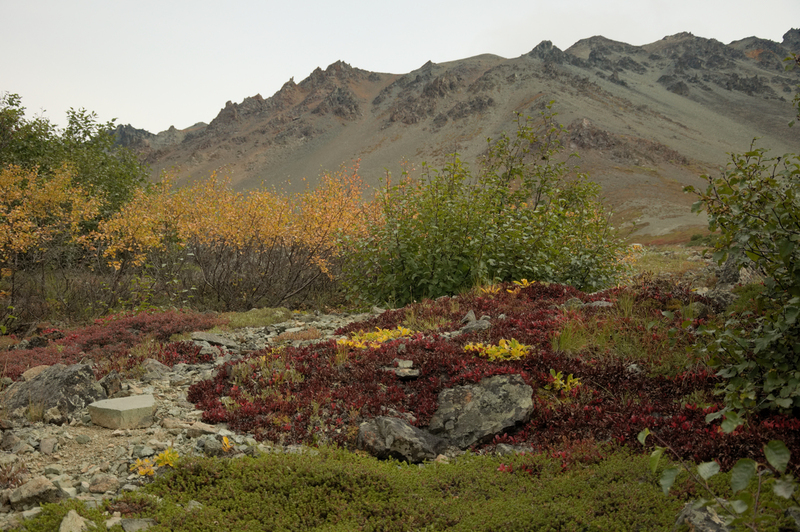 We continued to gain elevation until the sliding talus gave way to tundra and the colors became spectacular. It’s already fall in much of Alaska and the colors were really starting to show here. The terrain and view at the first little outcropping above the alders. Once up on the first little bump we got some great views of the Delta River down below. We still had to trudge through some low bushes and make our way through a couple of short stretches of loose talus, but the hiking was pretty mild. Within a few minutes and a couple zig-zags we were out into the open. Nice fall colors in the valley. We pretty much just wander uphill. Jason at the top of our journey. Now its time for some ridge-walking. We had some choices: hug the main talus slope, down to a small lake, or stay on the ridge and head north. We liked the idea of staying on tundra so we stayed on the ridge. Really cool view of the mountains, Delta River, a little alpine lake, and the pipeline. Jason taking some foliage shots with Rainbow Ridge to his back. Sometimes the red and yellow covers the landscape, In the really rocky terrain it it just dots it. Eventually the ground changed from rocky to two foot deep “sponge” and walking became tiring very fast. We probably walked for more than an hour on the soft stuff and I was getting pretty done with it. We did see ptarmigan, though. Jason on the “trail”. I get the feeling people don’t come out here often. We eventually decided to abandon the ridge for the yellow valley below. A bit more swimming through alders. 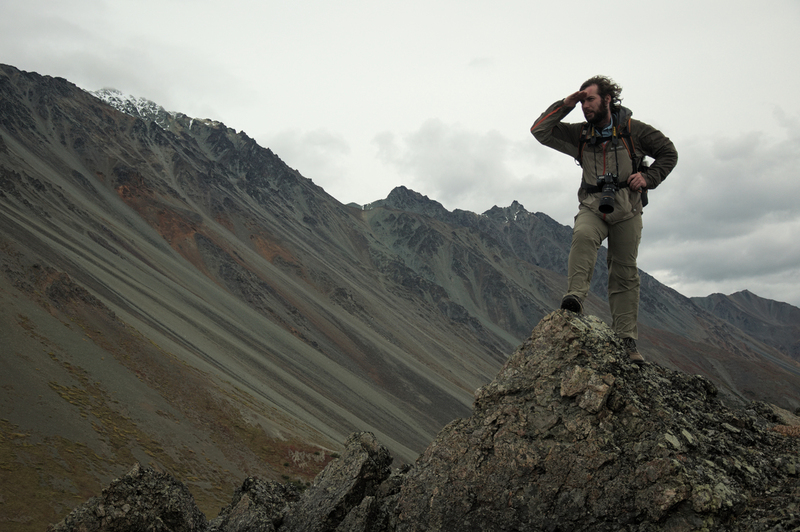 Once through the thick alders we stumbled into a rocky valley with a jeep road. We walked on the unmaintained road that begins to parallel the Canwell Glacier, reaching a fairly fast stream. Here we decided to turn around, since this was going to end up being about an 18 mile hike and my legs were already starting to feel trashed. I need more time to explore! On the drive home we saw lots of moose, a swan, and some cool evening light in the valley just off the Richardson Highway. The sunset when we reached the Tanana River just north of Delta Junction was by far one of the best I’ve ever seen.